Biden in Moscow: All smiles, no substance? At a crucial moment for U.S. domestic policies, Joe Biden was in Moscow, and it seems unlikely that bilateral trade was foremost on the agenda. If a contest for the best smile was held among leading American politicians, Vice President Joe Biden would win hands down. Last week, Biden’s trademark pearly whites and folksy manners were on display in Moscow during a three-part European trip that also included visits to Finland and Moldova. It’s likely, though, that Biden’s relaxed way of presenting himself didn’t fool his Russian hosts, who are well aware of his reputation as a tough interlocutor and a foreign policy hawk. In Moscow, Biden met with President Dmitry Medvedev and Prime Minister Vladimir Putin; visited the Moscow School of Management at Skolkovo where he spoke to U.S. and Russian business executives and presided over signing of a $1.6 billion business deal between Aeroflot and Boeing. He also met with Russian human rights and political activists and, finally, gave a speech at Moscow State University. The status of Biden’s visit – marked as “working”– precluded the issuing of a formal statement and a briefing for the press, so it is possible only to speculate which topics dominated Biden’s talks with the Russian leadership. According to Biden himself – a point he made in an interview on the eve of the trip and then repeated at the meeting with business leaders at Skolkovo – the primary purpose of his visit was to boost U.S.-Russia economic relations. 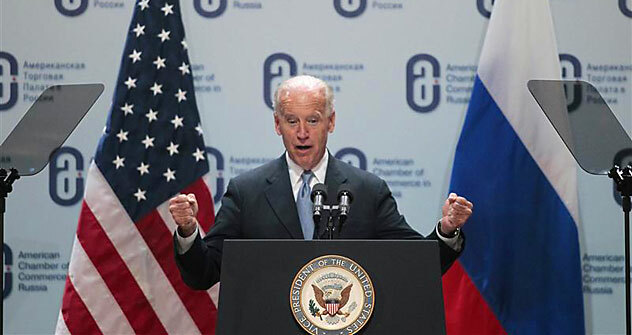 To this end, on every occasion, Biden emphasized the Obama administration’s support for Russia’s accession to the WTO. As if tacitly acknowledging that this process could be effectively vetoed by Georgia, Biden enigmatically noted that the U.S. “is working with other countries” to make Russia’s accession happen. Biden was in Moscow. And what exactly was he doing there? Reiterating again American support for Russia’s membership in the WTO? Repeating, for the umpteenth time, the administration’s promise to repeal the Jackson-Vanik amendment—which the current Congress will refuse to do anyway? Listening to the never-ending whining of Russian human rights activists and “opposition leaders?” For all that, Obama could have sent Secretary of State Hillary Clinton, giving her a much-needed break from relentless efforts to unseat the Libyan strongman Muammar Gaddafi. Certainly if Obama has chosen his vice president to converse with the top Russian leaders, then the topic of this conversation was the most important issue in U.S.-Russia relations. Today, such an issue is not the WTO or bilateral trade – with all due appreciation of the long-term importance of both – but, rather, the issue of missile defense. The pressure is building on the Obama administration to move into the post-New START era. In the resolution ratifying the treaty, the U.S. Senate instructed the president to initiate, within a year, U.S.-Russia talks on cutting arsenals of tactical nuclear weapons, where Russia has a substantial numeric advantage. So far, Russia has flatly refused this idea, arguing that the topic of tactical nuclear weapons can only be discussed in coordination with other arms control issues. Among those, missile defense is by far the most complex and controversial, and the clock is ticking: some contours of the potential agreement should emerge by June 2011, when the pivotal Russia-NATO meeting is to take place. As one of the principal architects – and the godfather – of “reset,” Biden was sent to Moscow to give his godchild a new life: to find a solution that could bridge the two countries’ very different positions on missile defense, a solution that will be fully supported by the next president of Russia, whoever he might be. For his part, the vice president could promise his Moscow partners that if Obama gets re-elected in 2012, Biden, too, will be around for the next four years – shepherding “reset” through adolescence. And then Russia will have another chance to enjoy his smile.